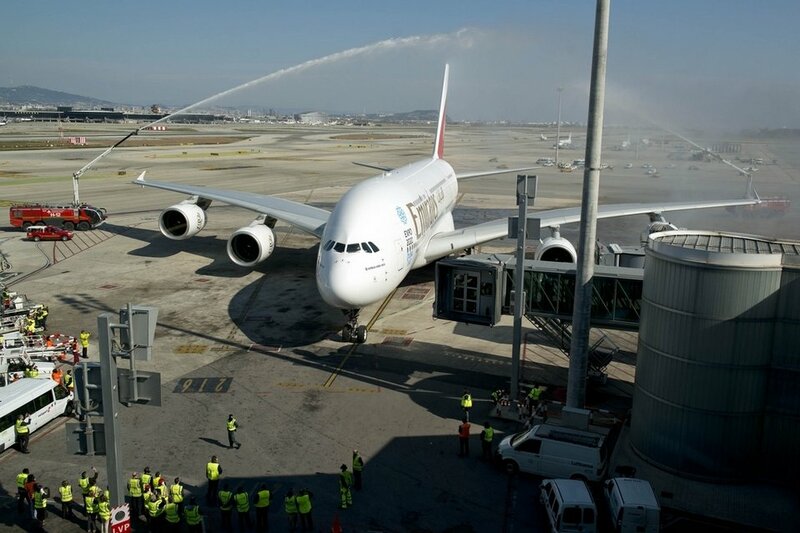 An Emirates Airbus A380 has landed this afternoon in Barcelona, ​​for the first time in Spain, amid great expectations of media and fans, who wanted to capture with their cameras the arrival of the largest commercial aircraft the world. The aircraft has flown with 517 passengers on board, who have traveled to Barcelona for the Mobile World Congress, the World Congress of mobile phones, to be held from 25 to 28 February at the Gran Via exhibition center The flight , from Dubai, has landed as scheduled on 12:10 pm, an arrival that have been commissioned to record and photograph dozens of reporters and aviation enthusiasts from near the airport of El Prat. The Airbus A380 is a double-decker aircraft features private suites, a bar, showers and business areas for first class passengers. Emirates is the largest A380 operator in the world, but says that, for now, has no immediate plans to operate Airbus A380 is a double-decker aircraft features private suites, a bar, showers and business areas for first class passengers. Emirates is the largest A380 operator in the world, but says that, for now, has no immediate plans to operate in Spain with an A380 on a regular basis. The upcoming Mobile World Congress has shot this weekend activity Prat Airport, which increased by more than 100,000 seats offered to meet the demand for conference attendees. As for private flights, the airport of El Prat has so far provided more than 150 corporate aviation operations, 75 arrival and 75 departure, although these figures may increase over the next week. The strongest days are expected to be on Monday and Wednesday 27 25, 32 and 29 moves, respectively.